We introduce a novel hypoxic chamber system for use with aquatic organisms such as frog and zebrafish embryos. Our system is simple, robust, cost-effective and allows the induction and sustainment of hypoxia in vivo and for up to 48 h. We present 2 reproducible methods to monitor the effectiveness of hypoxia. Khaliullina-Skultety, H., Zi Chao, N., Harris, W. A. Induction of Hypoxia in Living Frog and Zebrafish Embryos. J. Vis. Exp. (124), e55710, doi:10.3791/55710 (2017). Here, we introduce a novel system for hypoxia induction, which we developed to study the effects of hypoxia in aquatic organisms such as frog and zebrafish embryos. Our system comprises a chamber featuring a simple setup that is nevertheless robust to induce and maintain a specific oxygen concentration and temperature in any experimental solution of choice. The presented system is very cost-effective but highly functional, it allows induction and sustainment of hypoxia for direct experiments in vivo and for various time periods up to 48 h.
To monitor and study the effects of hypoxia, we have employed two methods - measurement of levels of hypoxia-inducible factor 1alpha (HIF-1α) in whole embryos or specific tissues and determination of retinal stem cell proliferation by 5-ethynyl-2′-deoxyuridine (EdU) incorporation into the DNA. HIF-1α levels can serve as a general hypoxia marker in the whole embryo or tissue of choice, here embryonic retina. EdU incorporation into the proliferating cells of embryonic retina is a specific output of hypoxia induction. Thus, we have shown that hypoxic embryonic retinal progenitors decrease proliferation within 1 h of incubation under 5% oxygen of both frog and zebrafish embryos. Once mastered, our setup can be employed for use with small aquatic model organisms, for direct in vivo experiments, any given time period and under normal, hypoxic or hyperoxic oxygen concentration or under any other given gas mixture. Hypoxia research has numerous applications. These include investigating the pathogenesis and developing treatments for medical conditions characterized by hypoxia1 and acute high altitude illness2. Hypoxic stress causes major metabolic changes in all organisms requiring oxygen. Hypoxic stress also influences fetal growth and development and the pathogenesis of several human diseases, including intrauterine growth restriction3. Hypoxic stress can not only lead to reduced birth weight, fetal and neonatal mortality, but can also result in many complications in adult life, such as cardiovascular disease, type-2 diabetes, obesity, and hypertension4. Hypoxic stress is also often observed during solid tumor development, when the tumor tissue outgrows its blood supply. It is therefore crucial to be able to study the effects of hypoxia in vivo and directly during embryonic development. Among the most well-known methods that have been employed to study effects of hypoxia during development is the use of cobalt chloride in the growth medium or incubation of the organism in a hypoxic chamber. Cobalt chloride artificially induces a hypoxic response under normal oxygen concentration, due to its role in the stabilization of hypoxia-inducible factor-1 alpha (HIF-1α) by preventing its proteosomal degradation5,6,7. However, being a convenient method8, the use of cobalt chloride as well as other similar chemical hypoxia mimetics can have unspecific deleterious effect on cells and tissues, e.g., apoptosis9. Therefore, hypoxic chambers are a better method for induction of "natural hypoxia" in living organisms through the course of normal development. We have focused on developing a system for induction of hypoxia in aquatic animal embryos. Both frogs and zebrafish have now become informative vertebrate model organisms for studies of numerous biological processes, as well as models for various human diseases. Frog and zebrafish embryos develop externally, eliminating the complication of maternal compensation. Further, a fast course of development makes it possible to manipulate environmental factors and observe the phenotypic changes in organ formation in real time. In addition, many components of major signal transduction pathways are highly conserved in these model organisms and have been characterized in detail by a large body of literature. The main advantage in using frogs and zebrafish embryos to study the effects of hypoxia on vertebrate development is that all processes can be monitored directly, since oxygen quickly penetrates the embryos. Thus, in frogs and zebrafish, as in contrast to other model organisms such as mouse embryos, the influence of a specific oxygen concentration can be studied in the tissue of interest, without taking into consideration the presence or lack of functional vasculature. Most commercially available setups for hypoxic incubation have the disadvantage of being comparably large and having correspondingly high running costs. Apart from their high initial cost and gas consumption, equilibration and maintenance of common hypoxia chambers requires sustainment of constant hypoxic atmosphere against the gas gradient that naturally occurs in these chambers because of their larger size and/or organism respiration. This requires employment of gas fans and a cooling system, which increases the amount of additional necessary equipment, impedes the dexterity of the researcher and overall decreases simplicity of experimental procedure. In contrast, the setup we present here is comparably robust but very cost-effective, small, easy to establish and allows fast gas equilibration, stable hypoxic atmosphere and simple exchange of materials and solutions within the chamber. Our system can be employed for use with any aquatic model organism of interest. We have constructed a hypoxic chamber that is conveniently small and therefore can be placed inside a common laboratory incubator, which easily allows experimental procedures at any specific temperature. Providing convenient control of temperature as well as oxygen concentration in the medium, the advantage of our system against the commercially available hypoxia incubators lies in its small size and cost efficiency. Thus, our setup can be established using general laboratory supplies available for the majority of research labs and does not require any expensive materials. In addition, our setup does not generate heat, unlike the commercially available hypoxia incubators, and allows use at temperatures lower than room temperature being placed in an incubator. The last is especially critical for the work with cold-blooded organisms such as frogs and fish where developmental and metabolic rates are strongly temperature dependent. Being very cost-effective and easily built, our gas incubation chamber is nevertheless very versatile in establishing various hypoxic or hyperoxic conditions, as well as enabling quick and easy administration of different media and solutions for a vast number of experimental conditions. In addition, employing a 24-well plate instead of commonly used dishes or laboratory tanks10,11,12, our system allows observation and experimental treatment of several mutant conditions at once. 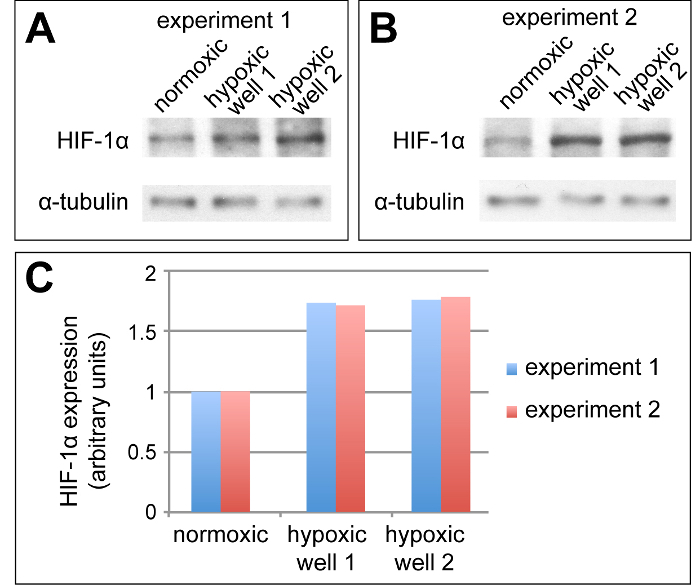 To control for correct induction of hypoxia, we have monitored the levels of the HIF-1α protein by Western blot detection. In addition, the number of proliferating cells before and after incubation in the hypoxic chamber can be used to determine if hypoxia has been induced in the tissue. This method is based on our previously published results13, showing that proliferation in embryonic retinal stem cell niche decreases upon induction of hypoxia. Thus, we have monitored the level of retinal stem cell proliferation by adding 5-ethynyl-2′-deoxyuridine (EdU) to the embryo medium and measuring its incorporation into the DNA of newly proliferating cells. This protocol follows the animal care guidelines of the University of Cambridge. NOTE: Embryos can be raised and maintained according to the animal and laboratory facility. Here, an example of the animal maintenance is described. Prepare 0.1x Modified Barth's Solution (MBS) solution: 0.88 mM NaCl, 10 µM KCl, 24 µM NaHCO3, 100 µM HEPES, 8.2 µM MgSO4, 3.3 µM Ca(NO3)2, and 4.1 µM CaCl2, pH 7.6. Obtain Xenopus laevis embryos by in vitro fertilization. Induce ovulation in adult female African clawed frogs (Xenopus laevis) by injection with pregnant mare serum gonadotropin one week (60 IU) and 12 h (500 IU) prior to egg laying. Collect oocytes and fertilize them in vitro with homogenized male testis. Raise embryos in 0.1x MBS at 16 - 18 °C. Stage the embryos according to the Normal table of Xenopus laevis14. Take care in selecting whole and alive embryos for the experiment. Prepare embryo medium: 5 mM NaCl, 0.17 mM KCl, 0.33 mM CaCl2, 0.33 mM MgSO4, and 0.00001% methylene blue. Maintain and breed WT AB strain Danio rerio at 26.5 °C. Collect the embryos on the morning of fertilization, raise until 4 d post fertilization (dpf) at 28 °C in embryo medium prepared as described above, select and stage as previously described15. 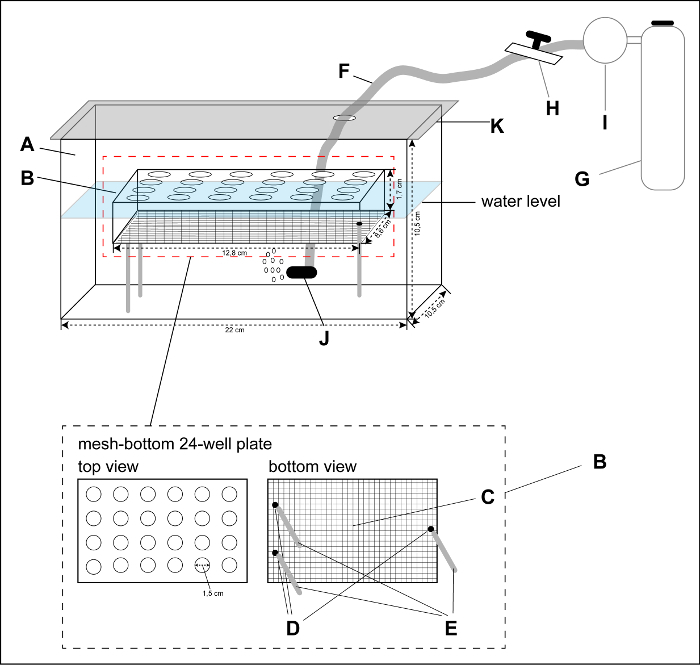 Use a breeding aquatic tank (Figure 1A) that is normally used in the fish facility for hypoxic chamber construction. This tank should fit a 24-well plate. Prepare a mesh-bottom 24-well plate as depicted in Figure 1. Remove the plastic bottom of the 24-well plate (Figure 1B), e.g., by using a milling machine for this purpose. Fill in the space between the plastic of the wells and the walls of the plate with epoxy resin. Attach any nylon filter (Figure 1C) with a mesh diameter of 0.1-0.2 mm to the resin-coated plastic and allow the plate to be completely dry. Once dry, drill three or four tunnels (Figure 1D) of 10 mm length and 5 mm diameter into the resin- and mesh-coated plate walls. Attach plastic or Teflon rods (Figure 1E) of appropriate diameter and 30 mm length to the tunnels and place the plate into the tank of choice. Place the mesh-bottom 24-well plate into the aquatic tank of choice. Using silicone tubing (Figure 1F), attach a gas tank (Figure 1G) with the desired O2/N2 mixture or another gas mixture of choice to a distributor valve (Figure 1H) using an appropriate gas regulator (I) (BOC 200 bar). Here, use gas tanks containing a mixture of 5% oxygen and 95% N2 in the hypoxia experiments presented here. Adjust the oxygen flow rate in the chamber medium to 0.0017-0.0019 cubic meters per second. Under this gas flow rate, no disturbance of the medium should be seen in the wells of the plate. Use the high purity two-stage gas regulator for this purpose. Set the regulator to reduce the inner pressure of the gas tank (1000 - 2500 PSI) to a delivery pressure of 10 PSI throughout the experiment. Thus, in accordance with the specifications of this gas regulator, a flow rate of 0.00189 cubic meters per second was achieved throughout the experiment. Connect the silicone tubing and the distributor valve to a ceramic disc diffuser (Figure 1J) inside the aquatic tank. Close the aquatic tank and carefully seal the lid, coating it with silicone grease (Figure 1K) (compare with the Figure 1). If a particular non-room temperature is required, place the hypoxic chamber into a laboratory incubator of required temperature. Depending on the type of embryos used in the experiment, fill the hypoxic chamber tank with the appropriate embryo medium and start diffusing the gas mixture through the ceramic disc diffuser. Equilibrate for 10-15 min. After equilibration with the desired oxygen mixture, measure oxygen concentration in the water using an oxymeter or oxygen probe. Here, use an oxymeter with the fiber-optic dissolved oxygen and temperature sensor for this purpose. Carefully select the embryos for the experiment, use whole and alive embryos for the hypoxia incubation. Here, us frog embryos of stage 38 or zebrafish embryos 4 dpf in the experiments presented here. Place the embryo dishes into the incubator (Figure 1K) containing the gas incubation chamber and let them equilibrate to the temperature of the incubator. Carefully transfer the embryos into the wells of the meshed 24-well plate (Figure 1B) of the gas incubation chamber, using a plastic pipette. Always use a plastic pipette for embryo transfer throughout the protocol. NOTE: Each well of this plate can contain up to 5 frog embryos of stage 38 or up to 7 zebrafish embryos of 4 dpf. Label the wells carefully if using different genotypes. Maintain the gas incubation chamber under a constant infusion with the gas mixture of choice for 5 h or for a longer time that suits the experiment. Use a mixture of 5% O2 and 95% N2 here. Carefully transfer the embryos from the gas incubation chamber back to the normoxic medium corresponding to the embryo type and immediately proceed with the Steps 3 or 4. If a further normoxic treatment is required, carefully transfer the embryos back to the normoxic medium corresponding to the embryo type. Prepare 0.4 mg/mL MS222 solution in 0.1x MBS. Prepare homogenization buffer: Purchase Radioimmunoprecipitation Assay buffer (RIPA buffer) for homogenization of tissue and supplement the amount of buffer necessary for your experiment with Protease Inhibitor to a final concentration 1:100 v/v. Prepare solutions for Western blot. Prepare 4x Laemmli gel loading buffer: 425 mM Tris pH 8.0, 40% v/v Glycerol, 8% v/v SDS, 4% v/v beta-mercaptoethanol, 0.5% w/v Bromophenol Blue, 10 mL total volume ddH2O. Prepare 5x running buffer: 15 g Trizma base, 72 g Glycine, 5 g SDS, 1 L total volume ddH2O. Prepare Transfer buffer: 2.66 g Trizma base, 14.4 g glycine, 200 mL 100% methanol, 1 L total volume ddH2O. Prepare 10x TBST: 5 mL 1 M Tris pH 8.0, 30 mL 5M NaCl, 2.5 mL Tween 20, 1 L total volume H2O. Prepare blocking solution: 4% w/v skim milk powder in 1x TBST. Anaesthetize the embryos by bathing in 0.4 mg/mL MS222 solution16,17 and transfer them into a plastic reaction tube filled with homogenization buffer using a plastic pipette. Use 20 µL buffer per embryo. Note that at least 5 frog embryos of stage 38 or 7 zebrafish embryos of 4 dpf are required to determine a significant change in HIF1α protein levels. Homogenize the tissue using an appropriate tissue homogenizer or a sonicator. Remove the debris by centrifugation (15 min; 13,000 x g; 4 °C). Alternatively, dissect the retinas from the anaesthetized frog embryos17 and homogenize as above. Use 20 µL of homogenization buffer per 10 retinas. Take the supernatant using a pipette, denature at 85 °C for 5 min and supplement with Laemmli gel loading buffer to a final concentration of 1x v/v (e.g., add 5 µL of 4x Laemmli buffer to 15 µL homogenate). Use this supernatant for the Western blot or freeze the samples at -20 °C. Load the samples prepared as described in Step 3.2 on a precast 12% gel in an electrophoresis system using 1x v/v Running buffer. Use a protein ladder for protein size determination. Transfer the proteins onto a nitrocellulose membrane (0.45 µm membrane) in Transfer buffer for 1 h packed on ice at 4 °C, as per manufacturer's protocol. Block unspecific binding sites incubating the membrane in Blocking buffer for 60 min. Follow with 3 x 10 min washes in 1x TBST. Incubate the membrane in solutions of rabbit anti-HIF-1α antibody and mouse anti-α-tubulin diluted 1:100 v/v and 1:5000 v/v, respectively, in Blocking solution, for 2.5 h at RT. Follow with 3 x 10 min washes in 1x TBST. For detection, incubate in goat anti-rabbit and goat anti-mouse HRP-conjugated antibodies diluted 1:1000 v/v in Blocking solution for 1 h. Follow with 3 x 10 min washes in 1x TBST and visualize the HRP staining using a commercial kit and a developer machine of choice. Quantify the amount of HIF1α protein using digital quantification. Prepare 5 mM EdU solution in the embryo medium of choice. The solution can be used immediately or aliquoted and stored at -20 °C for up to 6 months. Prepare Phosphate-Buffered Saline (PBS) or purchase PBS from commercial resources. Autoclave for 10 min at 115 °C. Prepare solutions for the detection of EdU incorporation. Prepare fixation solution: 4% v/v of 16% Formaldehyde stock solution in PBS. Prepare sucrose solution: 30% w/v sucrose in PBS. Prepare PBST: 0.1% v/v Triton X-100 in PBS. Prepare Blocking solution: 10% v/v Heat-inactivated Goat Serum (HIGS) in PBST. Prepare DAPI solution: 1:1000 v/v 4',6-diamidino-2-phenylindole (DAPI) in PBST. Fill the gas incubation chamber with 400-500 mL of 5 mM EdU solution supplemented with 1% v/v DMSO. Pre-equilibrate the solution with the same gas mixture used in the experiment for 15 min prior to the experiment. 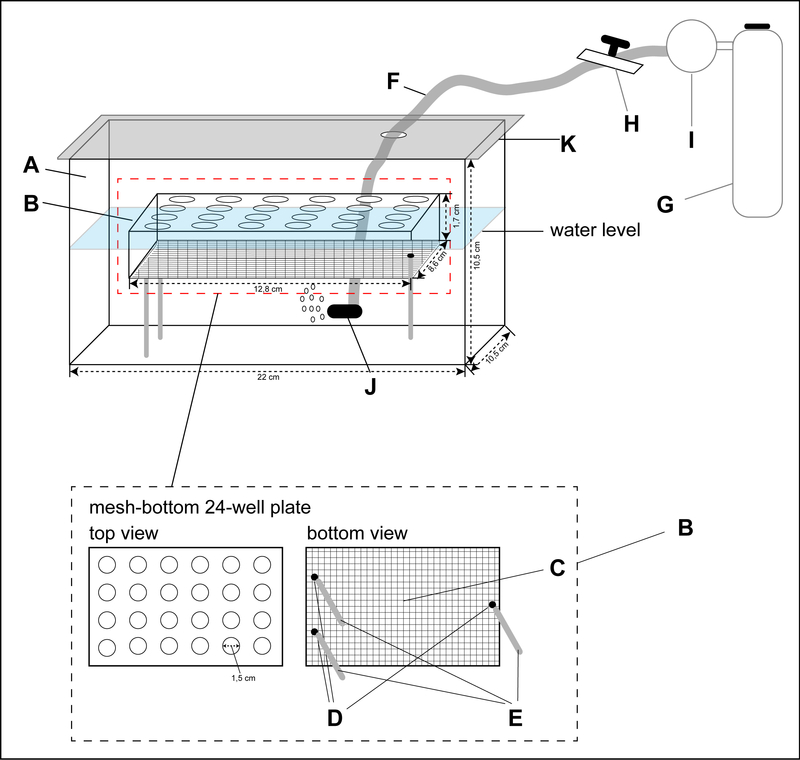 Note that the volume of the incubation solution can be minimized by attaching shorter rods (Figure 1E) to the mesh-bottom plate. Connect the gas tubing to the gas cylinder containing a gas mixture of 5% O2 and 95% N2. Incubate the solution for 15 min. Transfer the embryos to the hypoxic chamber, distributing them evenly between the wells and incubate for 2 h. Each well can fit up to 5 frog embryos of stage 38 or up to 7 zebrafish embryos 4 dpf. Analyze the embryos for EdU incorporation. Fill the gas incubation chamber with 500 mL of embryo medium of choice. Connect the gas tubing to the gas cylinder containing a gas mixture of 5% O2 and 95% N2 and equilibrate the medium with the gas mixture for 15 min. Transfer the embryos to the hypoxic chamber, distributing them evenly between the wells and incubate for desired time period up to 48 h. For the last 1 h, substitute the embryo medium with 5 mM EdU solution supplemented with 1% v/v DMSO. Transfer the embryos back to the normoxic dish and analyze for EdU incorporation. Anaesthetize the embryos by bathing in 0.4 mg/mL MS222 solution. Transfer the embryos to an appropriate glass vial and fix by incubating in Fixation solution for 2 h at RT or O/N at 4 °C. Follow with 3 x 10 min washes in PBS. Carefully transfer the embryos to the sucrose solution for tissue cryoprotection. Incubate for 4 h or until the embryos sink to the bottom of the glass vial. Embed the embryos in embedding medium (optimal cutting temperature compound). Cryosection blocks with embryos immediately or store for up to 14 d at -80 °C. Cryosection the blocks containing embryos using a cryostat. Collect sections of 12 µm (zebrafish embryos) or 16 µm (frog embryos) thickness on microscope slides and let dry. Process cryosections immediately or store at -20 °C for up to 3 months. Detect EdU incorporation by immunofluorescent staining using a commercial chemistry kit. Prepare the amount of EdU Reaction Mix necessary for the number of cryosections in the experiment, as described by the manufacturer. For 500 µL of EdU Reaction Mix, use 430 µL of 1X EdU reaction buffer, 20 µL of CuSO4, 1.2 µL of Alexa Fluor azide, 50 µL of 1X EdU buffer additive. Wash the cryosections once with PBS to remove the embedding medium and 3 x 5 min with PBST to permeabilize the tissue. Incubate the cryosections in Blocking solution for 30 min. Incubate the cryosections with the EdU Reaction Mix for 1 h and followed by 3 x 10 min washes in PBST. Costain the cryosections with DAPI solution for 15 min, followed by 3 x 10 min washes in PBST. Mount the slides with stained cryosections in mounting medium, cover with coverslips and leave to dry before analyzing under a fluorescent microscope or storing at 4 °C for up to 1 year. Analyze the cryosections with anti-EdU staining under an inverted confocal scanning microscope and determine the number of EdU-positive cells using digital quantification. Employing the hypoxic chamber system that we present here allows the study of the effects of hypoxia individually and in vivo in whole living animals. Hypoxia can be induced by placing entire frog or zebrafish embryos in the hypoxic chamber (Figure 1), and be undertaken on different combinations of conditions. An image of our completed gas chamber setup is shown in Figure 2. We have monitored oxygen concentration in the incubation medium using a fiber-optic oxygen sensor (2.1.9) at different time points during the experiment. These data indicate that we have induced stable hypoxia (6-6.5% dissolved oxygen) throughout our experiments (Table 1). First, we assessed ubiquitous as well as retinal levels of HIF-1α in normoxia and in hypoxia as induced in our hypoxic chamber. HIF-1α is a protein that is stabilized under low oxygen concentrations. We measured HIF-1α levels in whole frog embryo lysates kept under normal oxygen concentration or subjected to 5% hypoxia, and in lysates of their isolated retinas. As shown in Figure 3, HIF-1α is stabilized under hypoxia in both whole embryos and in retinas. The stabilization of HIF-1α is achieved in different wells of the mesh-bottom incubation plate (Figure S1). As we have previously shown, hypoxia affects proliferation of retinal stem cell progenitors in the Ciliary Marginal Zone (CMZ) of the retina13. Thus, monitoring the proliferation in the CMZ by means of EdU incorporation is a good marker for successful induction of hypoxia. We incubated embryos in a hypoxic chamber maintained at 5% oxygen and assessed retinal proliferation as described Step 4.2. 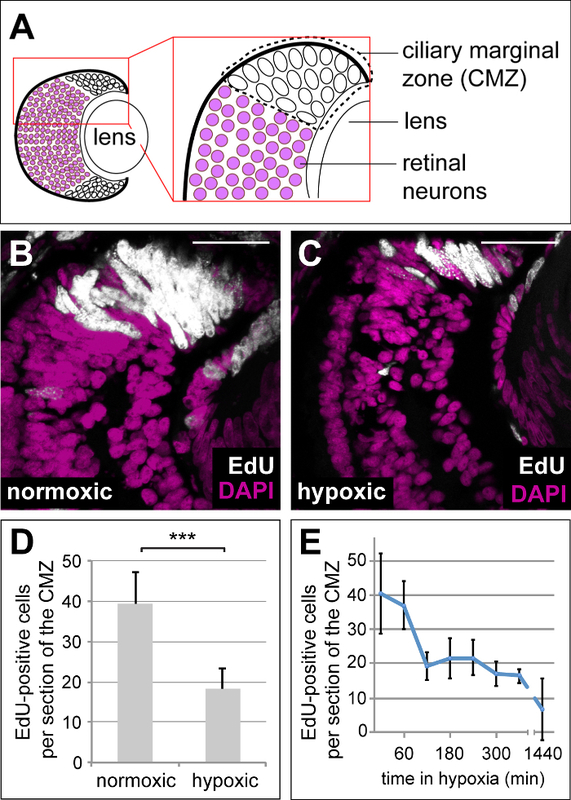 As expected, normoxic control retinas showed intense EdU staining in the CMZ, where proliferating progenitors reside in both frog (Figures 4B and 4D) and zebrafish embryos (Figures 5A and 5C). After oxygen deprivation in the hypoxic chamber, a strong decrease in CMZ progenitor proliferation was observed in both frog (Figures 4C-4D) and zebrafish embryos (Figures 5B, 5C). To determine the extent of the effect, we performed a time-course, incubating the embryos in hypoxic chamber for longer periods of up to 24 h, monitoring proliferation by EdU incorporation as described in Step 4.3. We could show that the decrease in retinal progenitor proliferation was acute and greatest within 2 h, and persisted for many hours (Figure 4D), while embryos developed normally according to their developmental stage. This result suggests that our system can efficiently induce hypoxia in a target tissue of interest, upon short incubation times as well as sustain these conditions for longer periods while supporting normal embryo development. Figure 1: Schematic Representation of the Experimental Gas Chamber Setup. (A) breeding aquatic tank (22 (length) x 10.5 (width) x 10.5 cm (height)) (B) mesh-bottom 24-well plate (12.8 x 8.6 x1.7 x 1.5 cm well diameter) (C) nylon filter with a mesh diameter of 0.1-0.2 mm (D) tunnels of 10 (length) x 5 mm (diameter) (E) Teflon or PVC rods of appropriate diameter and 30 mm length (F) silicone tubing (G) gas tank with the desired oxygen/CO2 mixture (H) distributor valve (I) gas valve (J) ceramic disc diffuser (K) tank lid. Please click here to view a larger version of this figure. Figure 2: An Image of the Experimental Gas Chamber Setup. Please click here to view a larger version of this figure. Table 1: Measurement of Oxygen Concentration upon Different Incubation Times in the Gas Chamber. Please click here to view a larger version of this figure. 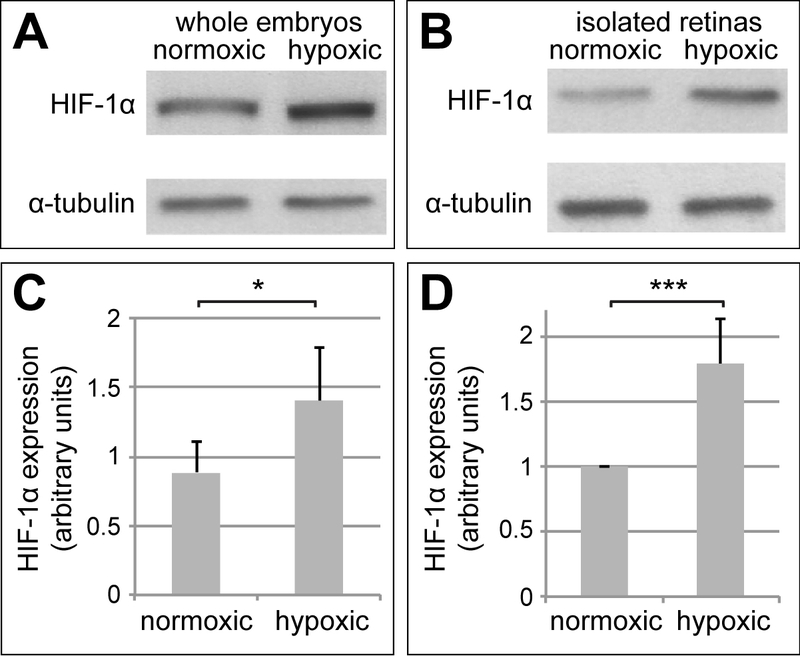 Figure 3: HIF-1α Levels Increase upon Hypoxia Induction in Xenopus Embryos and their Retinas. Western blots of protein lysates from whole embryos (A) or from isolated embryonic retinas (B) kept under normal oxygen concentrations or in hypoxia. Blots were probed for HIF-1α subunit and α-tubulin. At least 5 embryos or 22 retinas were taken for each condition (n = 5) (C, D) Quantification of the Western blot performed in (A, B), respectively. Protein levels of HIF-1α were normalized to the protein levels of α-tubulin. Error bars represent standard deviations between experiments. * p-value <0.05, *** p-value <0.001; n = 5. Please click here to view a larger version of this figure. Figure 4: Hypoxia Decreases Proliferation of Progenitors in the Retinal Stem Cell Niche of Frog Embryos. (A) Schematic representation of a cross section through a 38-stage Xenopus retina, indicating the position of the ciliary marginal zone (CMZ) (B, C) EdU incorporation measured after a 2 h EdU pulse in DAPI-stained retinas from 38 stage frog embryos kept under normoxia (B) or in the hypoxic chamber (C). Magenta = DAPI stain; Grey = EdU stain. Scale bars = 50 µm (D) Quantification of the experiment performed in B and C. Error bars represent standard deviations. *** p-value <0.001; n = 7. For each condition 10-15 retinas were quantified (G) Quantification of EdU-positive cells after an 1 h EdU incorporation in retinas from animals after various times in hypoxia (time in minutes indicated on the x-axis). Error bars represent standard deviations of two independent experiments (n = 2). For each condition and time point, a minimum of 10 retinas was quantified. Please click here to view a larger version of this figure. Figure 5: Hypoxia Decreases Proliferation of Progenitors in the Retinal Stem Cell Niche of 4 dpf Zebrafish Embryos. EdU incorporation measured after a 2 h EdU pulse in DAPI-stained retinas from 4 dpf old WTe zebrafish embryos kept under normoxia (A) or in the hypoxic chamber (B). Magenta: DAPI stain; Grey: EdU stain. Scale bars = 50 µm (C) Quantification of the experiment performed in B and C. Error bars represent standard deviations. *** p-value <0.001; n = 7. For each condition 10-15 retinas were quantified. Please click here to view a larger version of this figure. Supplemental Figure 1: HIF-1α Levels Increase upon Hypoxia Induction Consistently in Different Wells of the Plate and between Different Experiments. Western blots of protein lysates from whole Xenopus embryos kept under normal oxygen concentrations or in two different wells of the hypoxic chamber under induction of hypoxia for 2 hours in experiment 1 (A) or in experiment 2 (B). Blots were probed for HIF-1α subunit and α-tubulin. 5 frog embryos of stage 38 were taken for each condition. Experiment 1 and 2 are independent biological replicates (C, D) Quantification of the Western blots performed in (A, B), respectively. Protein levels of HIF-1α were normalized to the protein levels of α-tubulin. Please click here to view a larger version of this figure. Here we have presented an easy but robust new method to induce hypoxia that is adjusted for use with frog and zebrafish embryos but can also be suited for other aquatic organisms. The major advantage of this method lies in its simplicity and cost efficiency. Nevertheless, the results achieved with this method are very robust. We have shown that hypoxia can be efficiently induced in the chamber both in whole embryos as well as in specific tissue – here, retinas. To determine the effectiveness of hypoxia induction, we have monitored the levels of HIF-1α protein in whole embryo and retinal lysates. According to our results, hypoxia induction can be viewed as successful, if an increase of HIF-1α levels can be observed upon 1 h in the hypoxic chamber compared to normoxic control and normalized to global protein levels, e.g., using α-tubulin levels as control. We confirmed the activity of hypoxia in tissue by monitoring stem cell proliferation in retinas by EdU incorporation, and could show, in accordance with our previously published results13, that hypoxia induced using the setup presented here leads to a decrease of retinal stem cell proliferation in both frog and zebrafish embryos. One of the critical steps of this protocol is to ensure that the hypoxic chamber is properly sealed. It is accomplished by using an appropriate seal on the tank lid, which was silicone grease in our case. In addition, placement inside an incubator will help avoid leakage of atmospheric oxygen into the chamber, by providing an additional barrier. A measurement of oxygen concentration with an appropriate probe or electrode also ensures that hypoxic oxygen levels are kept stable and without fluctuations. Additionally, care should be taken to avoid chamber opening for long time periods while exchanging solutions or samples in between experiments. Given fast equilibration times of 10 - 15 min for hypoxia establishment, only a little amount of the gas mixture and a low gas flow rate are needed to sustain the system even for longer time periods than described in the representative results (24 h). The solutions used in the experiment should be pre-equilibrated to achieve hypoxia for 15 min prior to incubation in the chamber (as described in 4.2.1). 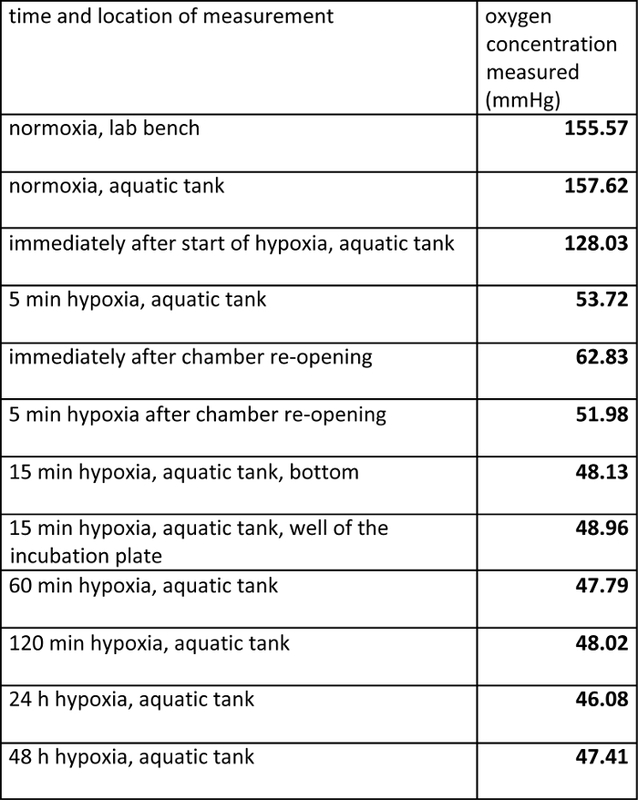 We have used the hypoxic chamber over the period of 48 h of constant hypoxia without any errors as seen from our oxygen concentration measurements (Table 1). It should be noted that correct gas diffusion must be controlled during longer incubation times. Finally, care should be taken while placing the embryos into the wells (Step 2.2.1.) to avoid the mixing up of embryos from different mutant animals/ experimental conditions. This is quite simple to achieve given the relatively high walls of the single wells of the plate. 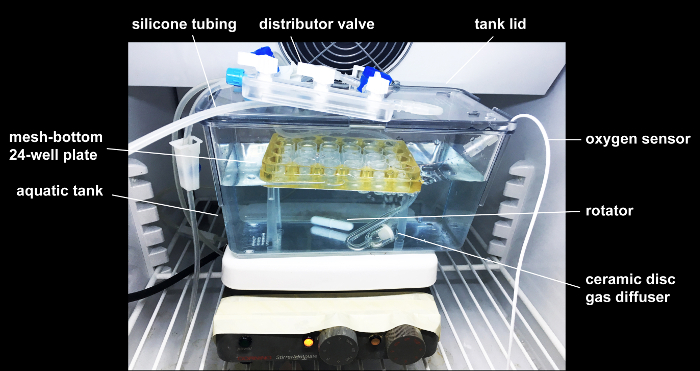 Despite being a simple but effective and robust system for hypoxia induction, the use of the chamber described here has one drawback for experiments that require use of expensive incubation solutions and media. The minimal volume of media in the chamber tank should not fall below 400 mL. However, adjustments can be made to suit lower volumes: We have succeeded to adjust the length of the rods (Figure 1E) attached to the plate (2.1.4 and 4.2.1) so that we would require only 50 mL of media/ solution. While not ideal for longer incubation times, this setup can fit the same gas tubing and can be appropriately sealed to ensure sufficient hypoxia for up to 8 h.
Taken together, our gas chamber setup can be employed for use with any aquatic model organism and is set apart from other similar commercially available systems by its simplicity, cost-effectiveness and robustness. Once mastered, it can be used for direct in vivo experiments, any given time period and under any desired gas atmosphere including hypoxia, hyperoxia or other gas mixtures. This work was supported by the Support from Wellcome Trust SIA Award 100329/Z/12/Z to W.A.H. and the DFG fellowship KH 376/1-1 awarded to H.K. Grocott, M., Montgomery, H., Vercueil, A. High-altitude physiology and pathophysiology: implications and relevance for intensive care medicine. Crit Care. 11, (1), 203 (2007). Grant, S., et al. Sea level and acute responses to hypoxia: do they predict physiological responses and acute mountain sickness at altitude? Brit J Sport Med. 36, (2), 141-146 (2002). Kajimura, S., Aida, K., Duan, C. Insulin-like growth factor-binding protein-1 (IGFBP-1) mediates hypoxia-induced embryonic growth and developmental retardation. PNAS. 102, (4), 1240-1245 (2005). Ong, K. K., Dunger, D. B. Perinatal growth failure: the road to obesity, insulin resistance and cardiovascular disease in adults. Best Pact Res Clin Endocrinol Metab. 16, 191-207 (2002). Maxwell, P., Salnikow, K. HIF-1: an oxygen and metal responsive transcription factor. Cancer Bio Ther. 3, (1), 29-35 (2004). Semenza, G. L., Roth, P. H., Fang, H. M., Wang, G. L. Transcriptional regulation of genes encoding glycolytic enzymes by hypoxia-inducible factor 1. J Biol Chem. 269, (38), 23757-23763 (1994). Yuan, Y., Hilliard, G., Ferguson, T., Millhorn, D. E. Cobalt inhibits the interaction between hypoxia-inducible factor-alpha and von Hippel-Lindau protein by direct binding to hypoxia-inducible factor-alpha. J Biol Chem. 278, (18), 15911-15916 (2003). Elks, P., Renshaw, S. A., Meijer, A. H., Walmsley, S. R., van Eeden, F. J. Exploring the HIFs, buts and maybes of hypoxia signalling in disease: lessons from zebrafish models. Disease Models & Mechanisms. 8, 1349-1360 (2015). Guo, M., et al. Hypoxia-mimetic agents desferrioxamine and cobalt chloride induce leukemic cell apoptosis through different hypoxia-inducible factor-1alpha independent mechanisms. Apoptosis. 11, (1), 67-77 (2006). Woods, I. G., Imam, F. B. Transcriptome analysis of severe hypoxic stress during development in zebrafish. Genom Data. 6, 83-88 (2015). Rouhi, P., et al. Hypoxia-induced metastasis model in embryonic zebrafish. Nat Protoc. 5, (12), 1911-1918 (2010). Stevenson, T. J., et al. Hypoxia disruption of vertebrate CAN pathfinding through EphrinB2 is rescued by magnesium. PLoS Genet. 8, (4), e1002638 (2012). Khaliullina, H., Love, N. K., Harris, W. A. Nutrient-Deprived Retinal Progenitors Proliferate in Response to Hypoxia: Interaction of the HIF-1 and mTOR Pathway. J Dev Biol. 4, (2), (2016). Nieuwkoop, P. D., Faber, J. Normal Table of Xenopus laevis (Daudin). Nieuwkoop, D. P., Faber, J. Garland Publishing, Inc. New York and London. (1994). Kohn, D. F., Wixson, S. K., White, W. J., Benson, G. J. Anesthesia and Analgesia in Laboratory Animals. (1997). McDonough, M. J., et al. Dissection, Culture, and Analysis of Xenopus laevis Embryonic Retinal Tissue. JoVE. (70), (2012).